Is Cory Booker Trying To Out-Crazy Maxine Waters? Is Cory Booker Trying To Out-Crazy Maxine Waters? Is Cory Booker Trying To Out-Crazy Maxine Waters? 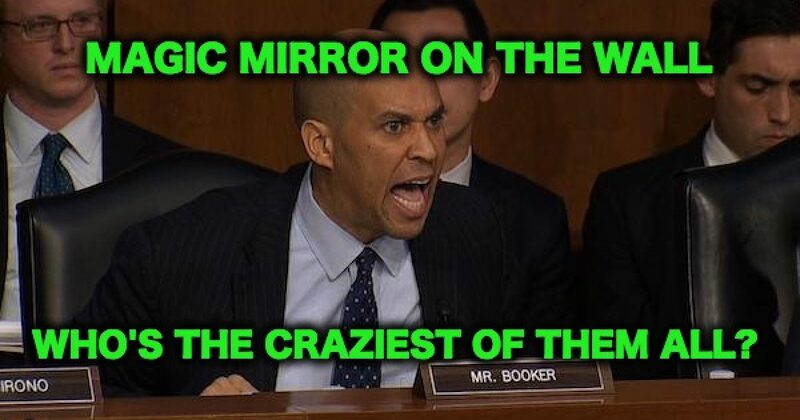 Booker (D-NJ) continued the incendiary rhetoric coming from prominent Democrats, telling his supporters that they need to “get up in the face” of some members of Congress. James Hodgkinson probably had similar thoughts at one point in time. Booker one-upping Waters is just the latest instance of what appears to an epidemic to outdo in craziness among the Democrats. Alexandria Ocasio-Cortez ousted a longtime staple of the party and presumed heir to Nancy Pelosi, and he’s now mumbling about reparations for illegal immigrants. Now, you’ve got people like Maxine Waters screeching about taking to the streets to call for Trump’s head and Booker encouraging them to “get up in the face” of Republicans. This is really quite alarming rhetoric. It wasn’t always this way for T-Bone’s friend. Before Maxine’s calls for harassing the political opposition, Booker used to be a man of love. I agree! And it starts with us. be an agent of hope in another’s life. We need to teach President Trump about love. When do you think Democrats will actually start embracing the concept of civility and love rather than getting their supporters all riled up about “evil” Republicans? Before it’s too late, one hopes.